The Carrie prom scene has to be one of the best parties in a horror movie. Kids getting dunked with pig’s blood, the school gym going up in flames, and lots of laughs all around. It doesn’t get much better than that. But can you imagine how much it would’ve sucked to have cleaned that mess up? And how many quarters it would’ve taken Carrie to get all that blood out of her dress at the laundromat? 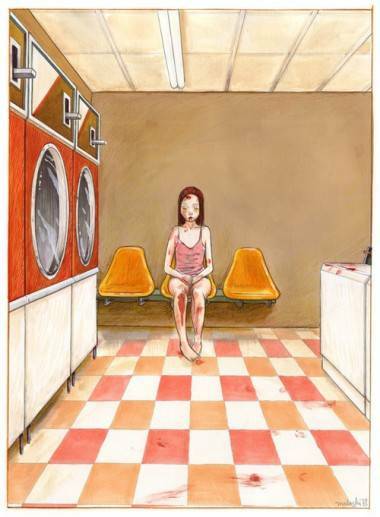 A fantastic painting by artist Malachi Ward titled “Carrie at the Laundromat” illustrates exactly that scenario, and it will be shown as part of this weekend’s Horror Hangover at Hot Art Wet City’s pop-up gallery. It’s one of 30 pieces that shows the aftermath of a horrific event. And if you want to haunt your walls with some original art from the show, it’ll only set you back $100—a ridiculous steal to pick up paintings from the likes of Al Columbia, Michael DeForge and Rebecca Dart. 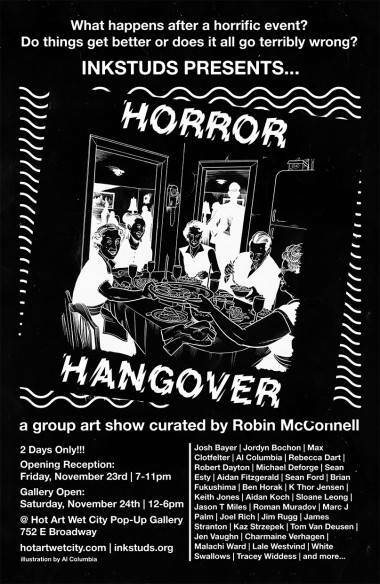 The opening reception is Friday Nov 23 from 7-11 p.m., and the Horror Hangover will rage the next day from 12-6 p.m. This entry was posted in art, events, Galleries, Homepage Features, Vancouver and tagged art, artists, comics, Gallery, Vancouver. Bookmark the permalink.